P. D. Hinduja Hospital & Medical Research Center has committed to go beyond its scope of service to serve the needy population of rural Maharashtra. As a part of this commitment, the hospital has successfully implemented many community engagement programs like 'Serve with passion – Hinduja Hospital Rural Health Program', a Mobile Health Unit (MHU) to support the rural and tribal areas of the state amongst others. On receiving the AHPI 2014 award for 'Excellence in Community Engagement', Mr. Joy Chakraborty, Chief Operating Officer, P.D. Hinduja Hospital & Medical Research Center said, "We are thankful to the organizers and jury members for recognizing our efforts and role in providing access to quality healthcare to all. We continuously work with community groups and organizations to bring quality health screening and educational programs to surrounding neighborhoods and enable individuals to make positive health decisions. Over the years, we have tried to further our services in other parts of the state and this award recognizes our impact in the community." P.D. Hinduja Hospital & Medical Research Center has been awarded for 'Excellence in Community Engagement' by Association of Healthcare Providers of India (AHPI) 2014 at Hyderabad on February 24, 2015. P.D. 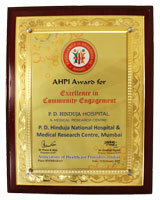 Hinduja Hospital & Medical Research Center has provided more than six decades of selfless and dedicated service of providing quality healthcare to the people of India and the hospital's community outreach programs range from physician seminars to special events like Diabetes Walk, Disaster Management Drills, Organ Donor Felicitation program and many more. The hospital has recently received various industry awards for healthcare delivery, innovation and technology. The institution's focus has always been to provide a patient centric healthcare experience that allows access to the best doctors and technology at an affordable cost.